136 Mini Film Cameras in the Smithsonian Institution History of Photography Collection With Old Style Photoshop Filter, is a set 17 photographs I took of the Smithsonian’s collection of mini-cameras during my Smithsonian Artist Research Fellowship. Though once revolutionary state-of-the-art tools for their small scale, in their current state these cameras are inanimate and obsolete, carefully tagged, boxed, and archived. I added the Photoshop ‘Old Style’ filter to emphasize the nostalgia these cameras often illicit, and made pigment prints on matt photo rag paper. 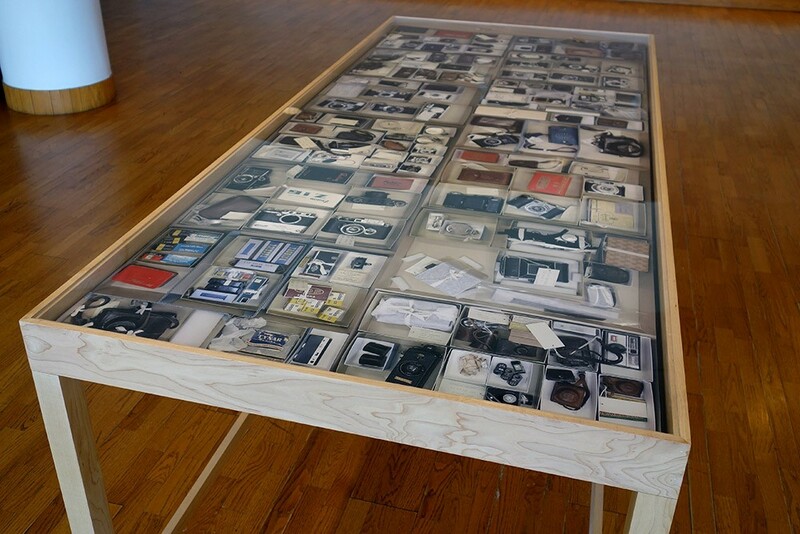 I laid them in a vitrine to emphasize their passive state - the matt surface disappears and the prints almost appear as actual faded cameras entombed within the vitrine. I often exhibit this work with Range: of Masters of Photography, to speak to an equivalency as well as an utter contrast with the smart-phone camera.